Inside the famed Janggyeong-panjeon at Haeinsa Temple from 1902. Haeinsa Temple was first founded in 802 A.D. The name of the temple, in English, means “Temple of the Ocean Mudra Temple.” Alongside Tongdosa Temple and Songgwangsa Temple, Haeinsa Temple is one of the three jewel temples. Haeinsa Temple represents the Dharma aspect of the three jewels. The temple is located in present day Hapcheon, Gyeongsangnam-do, and it was established by two monks: Suneung and Ijeong. According to legend, the temple was established after the two monks helped heal King Aejang’s wife from a serious illness. As a sign of appreciation, the king ordered the construction of Haeinsa Temple. Another story that surrounds the creation of the temple, as written by Choe Chiwon in 900 A.D., states that Suneung and Ijeong gained the support of the queen who had converted to Buddhism. Through her new found devotion, and financial backing, they constructed the temple. Either way, the amazing Haeinsa Temple was constructed for future generations to enjoy and appreciate. Throughout the years, Haeinsa Temple has been expanded a number of times first starting in the 10th century. It was then continued in 1488, 1622, and 1644. Tragically, the temple was burned to the ground in 1817 and was rebuilt the following year. Amazingly, the temple has had more than its fair share of fires with seven in total devastating the grounds. During the Korean War (1950-53), a crisis was averted in September, 1951. It would be the closest that the Tripitaka Koreana would come to its complete destruction. After the Battle of Incheon, South Korea was turning the war around; however, some North Korean forces refused to retreat. In total, about a thousand North Korean soldiers remained around Haeinsa Temple as a guerrilla force. The U.N. forces were ordered to bomb Haeinsa Temple using four bombers to weed out these enemy forces from allied territory. Fortunately, Kim Young was the leading pilot of these planes, and he disobeyed the command to bomb the temple. In time, the North Korean forces retreated and Haeinsa Temple was spared from bombing. Haeinsa Temple is best known for the Tripitaka Koreana, which was first housed at the temple in 1398. In total, 81,258 wooden blocks are housed inside the Janggyeong-panjeon, which acts as the blocks’ library. The Tripitaka Koreana was first made in 1087; however, they were completely destroyed by the invading Mongols. It would take over a hundred years, and from 1236 to 1251, for them to be remade again under the royal order of King Gojong (r. 1213-1259). Haeinsa Temple houses three national treasures and thirteen treasures. Of these three national treasures, all three are directly related to the Tripitaka Koreana including the wooden blocks and the blocks’ library, the Janggyeong-panjeon. In 1995, the temple was designated a UNESCO World Heritage Site. Visitors out in front of the Iljumun Gate at Haeinsa Temple from the turn of the 20th century. The Gugwang-ru Pavilion from 1915. The three-story pagoda from out in front of the main hall from 1915. The main hall from 1961. The former Samseong-gak; and now, present day Dokseong-gak, from the 1960s. Inside the Janggyeong-panjeon library, once more. How the Iljumun Gate looks in its present form. The main hall and three-story stone pagoda. A look inside the Janggyeong-panjeon in 2007. Unfortunately, you can no longer take any photography inside the library. The shrine that houses the ancient Buddha statue at Daeyulsa Temple in Gunwi, Gyeongsangbuk-do. Daeyulsa Temple is a little known temple that is small in size and is reached up a narrow alleyway-type road. In fact, I didn’t even notice it the first time I passed it. But once you finally do notice the gate for the temple with its metal manja across the gate, and the small entranceway that allows you access to Daeyulsa Temple, you’ll be pleasantly surprised by what awaits you. The first thing to greet you is a row of monks’ dorms to the left. And to the right is a house. A little further in, and you’ll notice the main highlight, by far, to this diminutive little temple. Standing out in front of the main hall, and under its own little protective shrine hall, is the Silla Kingdom (57 B.C. – 935 A.D.) statue of the Buddha. It stands 2.65 metres in height and is a bit strange. The right hand shows the mudra of boundless mercy, while the left hand is placed over the chest. The statue looks stiff in appearance with most of its facial features washed away by the passage of time. To the left of the ancient Buddha is the Sanshin-gak, which is just barely squeezed inside the stone fence confines of the temple. Inside rests a painting of Sanshin (The Mountain Spirit) with a cartoonish looking tiger by his side and a dongja (assistant) offering him peaches. Just behind these two shrine halls is the smaller-looking main hall. The concrete walls are adorned with fading Shimu-do, Ox-Herding, murals. As for the interior, and resting on the main altar, are a triad of statues centred by Seokgamoni-bul (The Historical Buddha). He’s joined on either side by Bohyun-bosal (The Bodhisattva of Power) and Munsu-bosal (The Bodhisattva of Wisdom). To the far left is a mural dedicated to Chilseong (The Seven Stars), while to the right hangs a painting of Jijang-bosal (The Bodhisattva of the Afterlife). In front of this painting is a slim-looking statue of a green haired Jijang-bosal. HOW TO GET THERE: There are two buses that go to Daeyulsa Temple from the Gunwi Intercity Bus Terminal. The first is the Gunwi to Dundeok bus, while the other is the Gunwi to 2nd Seokuram bus. In either case, you’ll need to take the bus for 16 stops and get off at the Daeyul 2 Ri stop. From this stop, you’ll need to walk eight minutes to the west to get to Daeyulsa Temple. OVERALL RATING: 4/10. This temple won’t blow you away with all the halls it offers. Instead, the main feature to Daeyulsa Temple is the Silla-era stone statue of the Buddha. There are a couple other features like the nice Sanshin painting and the Jijang-bosal statue, but the real reason anyone comes to this temple is to see the ancient Buddhist statue. The entrance to Daeyulsa Temple. The shrine and main hall at the temple. A look at the main highlight to this temple: the Silla-era Buddha. A closer look at the ancient Buddha. The Sanshin mural inside the Sanshin-gak, which is situated to the left of the shrine for the ancient Buddha. A look at the shrine, as you make your way towards the main hall. A look along the main altar inside the main hall at Daeyulsa Temple. To the far right is this statue of Jijang-bosal. The blue fading Ox-Herding murals. A look across the back side of the main hall at some more of the Ox-Herding murals. A look at the fish wind-chime and surrounding mountains under a gorgeous blue sky. Some purple flowers in full bloom along the country road. The view from the main hall at Jukrimsa Temple in Cheongdo, Gyeongsangbuk-do. During the spring, I made a day trip to the city of Cheongdo, Gyeongsangbuk-do and Jukrimsa Temple was the last of the three temples I had set out for myself. While smaller in size than the other two, it certainly had highlights of its own. You first approach Jukrimsa Temple up one of the stranger roads with spray paint scrawled all over abandoned buildings pointing you in the right direction. When you first arrive in the temple parking lot, you’ll have to make your way past the temple’s kitchen. Once you pass by this building, which kind of screens the temple courtyard, you’ll finally be able to see the main hall. The exterior walls to this diminutive main hall are painted with some fading, but beautiful, Palsang-do murals. Above these, and above the entrances, are murals dedicated to both Munsu-bosal (The Bodhisattva of Wisdom) and Bohyun-bosal (The Bodhisattva of Power). As you enter the main hall, you’ll be greeted by some of the smaller statues in a main hall in all of Korea. Seated in the centre is a tiny statue of Amita-bul (The Buddha of the Western Paradise). He’s joined on either side by two even smaller sized statues of Gwanseeum-bosal (The Bodhisattva of Compassion) and Daesaeji-bosal (The Power and Wisdom for Amita-bul). On the far left wall is a highly original mural of the Ten Kings of the Underworld. I can honestly say, I’ve never seen anything like it. It’s joined to the right by a mural dedicated to Jijang-bosal (The Bodhisattva of the Afterlife). And to the far right is a masterful, yet smaller in size, guardian mural. Out in front of the main hall is a two metre tall, five tier, stone pagoda. Between the main hall and the temple’s kitchen is a stone shrine dedicated to Yongwang (The Dragon King). The nuns’ quarters are the row of buildings to the far left in the temple courtyard. Between the main hall and the nuns’ quarters, there’s a set of stone stairs that leads to an upper courtyard that houses two more temple halls. The first, and much longer, temple hall is the Samseong-gak shaman shrine hall. Out in front of this building were some beautiful wild daisies. The exterior walls to this hall are painted with Shimu-do, Ox-Herding, murals. As for inside, and sitting in the middle of the set of three, is a rather long Chilseong (The Seven Stars) mural. To the right hangs a painting of Dokseong (The Lonely Saint) and to the right is one of the more unique seated murals dedicated to Yongwang (The Dragon King). He’s without both his angry beard and eyebrows. He actually looks quite pleasant. To the left of the Samseong-gak shaman shrine hall is the Sanshin-gak. Inside this smaller sized hall hangs a masterful portrait of Sanshin (The Mountain Spirit). Rather uniquely, and as you make your way back to the parking lot, there are some wild poppies growing there if you missed them the first time around. I say uniquely, because as far as I know, they are illegal to grow in Korea. Either way, the bright orange poppies are something to keep an eye out for, especially in the late spring and early summer months. HOW TO GET THERE: From the Cheongdo train station, you’ll need to take a taxi to Jukrimsa Temple. The taxi ride will last 7.5 k.m., and it’ll cost you 15,000 won. OVERALL RATING: 5/10. 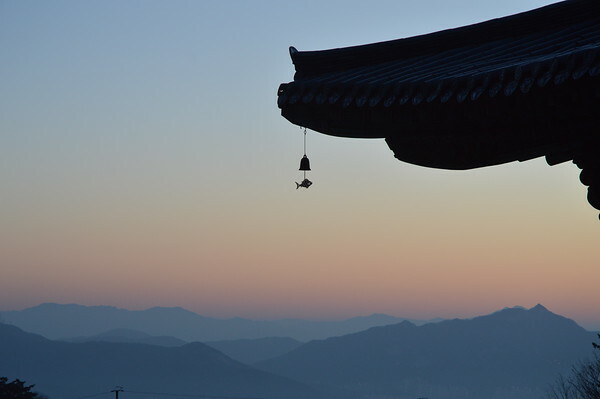 There are some beautiful views of northern Cheongdo from Jukrimsa Temple. In addition to the view and the rare poppies that greet you in the temple parking lot, the unique Ten Kings mural inside the main hall and the Yongwang painting inside the Samseong-gak shaman shrine hall are something to keep in mind when visiting this little traveled temple. The smaller sized main hall at Jukrimsa Temple. Just one of the Palsang-do murals. A look inside the main hall at the main altar with the smaller sized statues. The highly unique Ten Kings of the Underworld mural. A look up at the Samseong-gak. The rather large and long Chilseong mural. The Sanshin-gak at Jukrimsa Temple. The daisies out in front of the Samseong-gak. One last look from the temple courtyard. And the very rare orange poppies waiting for me in the temple parking lot. The front facade to Songgwangsa Temple from 1928. Songgwangsa Temple is located in Suncheon, Jeollanam-do on the western slopes of Mt. Jogyesan. Songgwangsa Temple means “Spreading Pine Temple,” in English. It was first established in the 1190s. However, Songgwangsa Temple was built on the grounds of a former temple, Gilsangsa Temple, which was built in 867 A.D. The original Gilsangsa Temple was constructed by Seon master, Hyerin. Not only did he help construct the temple, but he also lived there with thirty to forty fellow monks, as well. With that said, very little is known about Hyerin, and some scholars believe he might simply be a legendary figure. For some fifty years, Gilsangsa Temple remained abandoned in the mid-to-late 12th century. It wasn’t until the 1190, and over a nine year period, that the famed monk, Jinul, or Bojo-guksa (1158-1210) reconstructed the temple. The temple was renamed Songgwangsa Temple at this point, and it was not long after that it became an important centre for Korean Buddhism. Songgwangsa Temple, like numerous other temples throughout the Korean peninsula, has had a turbulent past. It suffered damage both during the Imjin War (1592-98), as well as during the Korean War (1950-53). However, coupled with this devastation, the temple has gone through periods of growth and expansion like during the Goryeo Dynasty (918-1392). Also, the temple was largely rebuilt in the 17th century after its destruction during the Imjin War. More recent renovations took place in 1988. During this time, fourteen buildings at the temple were refurbished. In total, Songgwangsa Temple has produced 16 national preceptors. In 1969, the temple was reorganized as a monastic centre for all sects of Mahayana Buddhism. Also, it was made an international meditation centre at this time. Historically, it’s one of the three jewel temples alongside Tongdosa Temple and Haeinsa Temple. Songgwangsa Temple represents the “seung,” or monk aspect of the three jewels with its large monk population, which still exists to the present day. In total, the temple houses four national treasures and a couple dozen treasures. An overview of Songgwangsa Temple from 1940. The welcoming Iljumun Gate from 1920. The picturesque front facade at Songgwangsa Temple. The Cheonwangmun Gate from 1920. And the former main hall from 1930. The present day Iljumun Gate. The beautiful front facade at Songgwangsa Temple. The massive main hall constructed in 1988. This is Giuseppe, back with my second contribution to the site. It’s a bit longer than I anticipated, but this temple is jam packed with sights, artifacts, and history. Even more than I was able to mention. I hope you enjoy! Last year, I asked a friend of mine to recommend a temple to visit in Mt. Bukhansan. “Doseonsa is supposed to be nice,” he replied. Looking it up, it did indeed seem like a nice temple with a wealth of history and attractions. When I managed to finally visit it, “nice” turned out to be a massive understatement! It was first dedicated in 862 A.D., by the renowned monk Doseon-guksa. He had a highly developed ability to read the flow of energy through the mountains and choose the most auspicious placement for temples. Even after Doseon-guksa’s death, Taejo Wang Geon, the founding-king of the Goryeo Dynasty, ordered that no temple should be constructed or expanded except those recommended by Doseon-guksa in the documents he left behind. I can only believe that the placement of Doseonsa Temple, below the triple peaks of the sacred guardian Samgak (Three Horn) Mountain, is a powerful one. Late in the Joseon Dynasty, around 1870, Doseonsa Temple was named the representative temple of Korea. It remains the largest temple complex in Mt. Bukhansan and Seoul’s most historically significant. The first object of interest (though it’s at the far rear of the temple) is the 8.4 meter Buddha carved into a triangular chunk of granite protruding from the ground. According to legend, Doseon-guksa carved it using only his wooden staff and there are no signs of chisel marks. The carving is now enshrined in a small, walled-off area where a seemingly perpetual group of laypeople are bowing, praying, or reciting sutras. The entrance to the temple is by the shuttle parking lot, where you immediately come upon the Cheonwangmun Gate. They are carved with fierce expressions, enough to make me wonder whether the chicken wire is meant to keep the pigeons out or keep them in. Continuing through the gate, the road soon bends, giving the first glimpse of the temple with the massive granite peak looming beyond. There is also a spectacular view of the northern tip of Seoul, perfect for watching the sunrise, framed with mountains fading into the horizon. Just before reaching the actual temple complex there is a poignant Jijang-bosal, standing tall on a granite pedestal. Among many things, Jijang-bosal is known as a guardian of children and is often depicted holding a child. This statue has a child at his side, reaching up to tug on his robe, but the main feature that caught my attention was the fetus held up in his right hand. After first seeing it, I learned that he is also the guardian of aborted fetuses. The road continues, steeply, up past the massive building that houses a museum, offices, dining hall, and a small Cheonbul-jeon, Thousand Buddha Hall, crowned with a large Geum-dang, then eventually leads into the courtyard. Centered at the back of the courtyard, facing the Geum-dang is the Daeung-jeon (Dharma Hall) with the beautiful Samseong-gak (Three Spirit Shrine) to the immediate left and the Jijang-jeon on its own separate terrace below, a bit further to the right. Inside the Dharma Hall is quite stunning, with the glow of pink lanterns illuminating the hall and reflecting off of the three gold shrines, giving the small figures a beautiful pink glow that complements the gold to make a unique aesthetic. Below the Samseong-gak are low-relief standing Bodhisattvas, cast presumably in bronze and are quite stunning. They include Bohyun-bosal, Gwanseeum-bosal, and Munsu-bosal, elegantly holding a cup of tea. Around the corner, tucked into the far corner of the structure is a unique Gwaneum-jeon, with the object of worship being a low-relief stone carving of the Bodhisattva and the zig-zagging walls lined with rows of small replicas of the Buddha carving outdoors. Entering the Samseong-gak, there is a nice Sanshin (Mountain Spirit) statue, sitting on a tiger, with an even nicer Sanshin painting behind it, with two tigers, one yellow and one white. In the middle is a Chilseong-yeorae-bul (The Seven Stars). But it’s really the stone Dokseong statue on the right that steals the show. Though it’s known as Dokseong (The Lonely Saint), it’s style suggests that it was likely originally part of a 16 statue set of Arhats (Buddha’s prime disciples) and at some point in time became separated. But, as it’s long been known as Dokseong, it’s now known as a rare example of him carved in stone. In the Jijang-jeon, on the right, the main points of interest are the portraits enshrined inside. On the left are President Park Chung Hee, South Korea’s most notorious dictator, and Yuk Yeong Su, parents of the current president, Park Geun Hae. On the left side is Hyundai Chairman Chung Ju Yung. I think it’s an interesting display of South Korea’s love/hate relationship with President Park, for his portrait to be enshrined at such a highly revered temple. Though his means were ruthless, he is credited with having pulled the South out of the mud in the decades following the war. “You can spit on my grave,” he famously spoke. First, Yuk Yeong Su was killed during an attempted assassination, then President Park was was assassinated in October, 1979. It’s said that he was a devout Buddhist, though, judging by his rule, he failed to truly grasp the teachings. Heading across, now, to the large Geum-dang Hall, there is a set of small, but masterfully carved Buddhas. When two of the original set were damaged by fire, they were replaced, in 1740, by Master Monk In Seong and his apprentice, Master Monk Chi Jung. Together, they were known as the premier sculptures of their day. There is a distinctive style, especially in their facial features that give them a recognizable style. In the photo below, the Amita-bul (center) and Daesaeji-bul (left) were the Masters’ work. The Gwanseeum-bosal to the right was from the original set. On the far right wall is a large painting of Cheongdam Daejongsa, a very prominent monk of the 20th Century, who led the Korean Buddhist revival here at Doseonsa Temple. The museum below the Geum-dang is the Cheongdam Daejongsa Memorial Hall, where you can see his personal remains, including his robes, calligraphy set, a dusty old Nikonama camera set, and two staffs that give the impression that they may be holding some magical powers inside. The real treat, though, was seeing his amazing calligraphy on display in the hall. Across from the Geum-dang, heading there is a trail that leads into the hillside, past the bell pavilion and to a large granite staircase with four terraces, including a statue of Cheongdam Daejongsa, a memorial stone on the back of a dragon-turtle that reminded me A LOT of Bowser from Super Mario Bros, and finally an impressive stone pagoda encircled by a wall of small Buddhas, and a seated Jijang-bosal overlooking in the center. The granite rail surrounding the pagoda has several dragon heads poking up, to add some interesting detail. There are a few other things to see, but I’ll leave them for you to discover. HOW TO GET THERE: There is a free shuttle bus up to the temple entrance from across the street from the Uidong bus terminal, or it’s about a 40 minute walk. Several green and blue buses will get you to Uidong, including 151 and 109 (the last stop for both). 109 passes in front of Gyeongbokgung and Changdeokgung Palaces early in their routes though I caught it at the Jogyesa bus stop. 151 and 109 can both be caught at Mia Station, as well. OVERALL RATING: 10/10. You will not find a better temple than Doseonsa Temple in the Seoul area for its combination of beautiful setting, historical significance, and wonderful artifacts. It also has ties to two hugely significant Seon Masters. And depending on where you live in the city, it’s really not difficult to get to. Jijang-bosal, holding a fetus. He is the guardian of aborted fetuses. Doseonsa Temple’s Daeung-jeon, on a lovely, early fall morning. You can spot the Samseong-gak, just below the lanterns. Daeung-jeon, with its colorful lantern display. An interesting shrine that I’m not sure of its significance. It seems to summarize some of the temples history or something similar. View from the upper terrace, through the entrance of the stone Buddha shrine. Face of the large Buddha carving. Bodhidharma, riding the a reed across the sea. He usually has a single sandal dangling from his staff, but not here. Inside Daeung-jeon, Great Spirit Daehwa on the left, Daeseaji-bosal, Amita-bul, Gwanseeum-bosal in the center, and Jijang-daehwa on the right. The beautiful Jijang-jeon. I always love the blue tiles. Inside the Geum-dang. The central Buddha and the Bodhisattva on the left are Master Monk In Seong’s work. Sunrise just striking the highest peak of Mt. Samgaksan. Sanshin, Mountain Spirit, lights, inside the Samseong-gak, Three Spirit Shrine. Gwanseeum-bosal, below the temple souvenir/gift shop. Full-circle… Uidong bus terminal on the right, Doseonsa Temple shuttle on the left. The beautiful main hall and grounds at Gyeongunsa Temple in Gimhae, Gyeongsangnam-do. Gyeongunsa Temple is located on the west side of Gimhae and past a few plots of land that grow vegetables. Located at the base of Mt. Gyeongunsan is the temple by the very same name: Gyeongunsa Temple. Up a long flight of stairs, and to the left of the temple’s visitors’ centre, are the main temple grounds at Gyeongunsa Temple. The temple grounds are well kept. Past a pair of stone lions lies the temple’s main hall. However, before you make your way up to the unique main hall, have a look at the tiny meditative pond to the left of the twin lions. As for the main hall itself, it’s fronted by some amazing latticework. At the top of the latticework are a selection of various Bodhisattvas which include Gwanseeum-bosal (The Bodhisattva of Compassion), Jijang-bosal (The Bodhisattva of the Afterlife), Bohyun-bosal (The Bodhisattva of Power), and Munsu-bosal (The Bodhisattva of Wisdom). At the base of the latticework are an assortment of water fowl including ducks and cranes. As for the exterior walls of the main hall, they are decorated with some unique Palsang-do murals. And up in the eaves, near the roof, you might be able to see a pair of monkeys near the hall’s nameplate. Inside the main hall, and resting on the main altar, sits Amita-bul (The Buddha of the Western Paradise). He’s joined on either side by Gwanseeum-bosal and Daesaeji-bosal (The Power and Wisdom of Amita-bul). To the left of this triad stands Jijang-bosal. And to the right is the first V-shaped guardian mural I have seen in Korea. To the right rear of the main hall, and up the embankment, are two shaman shrine halls. The first to greet you is the Yongwang-dang, which is spelled backwards as 당왕용. Inside this hall is one of the most original murals dedicated to Yongwang in all of Korea. Yongwang is very non-traditional, as he almost looks like a super-hero in the painting. Slightly to the left of this shaman shrine hall is the Sanshin-gak. Housed inside this hall is another original painting, probably by the same artist, of Sanshin (The Mountain Spirit). With a unique headdress and two descriptively painted assistants, this painting is something to take your time and enjoy, as well. The remaining structure to the rear of the main hall is the miniature replica of Dabo-tap pagoda from Bulguksa Temple in Gyeongju. While only a third of the size, this newly constructed pagoda is just as intricate in its design. And the final building on the grounds that visitors can enter is the Samseong-gak shaman shrine hall to the left of the main hall. Rather strangely, there are only two paintings inside this hall: the Dokseong (The Lonely Saint) painting and the Chilseong (The Seven Stars) painting. But both are rather rudimentary in comparison to the other two highly elaborate murals to the north of the main hall. HOW TO GET THERE: On the Busan/Gimhae subway line, you’ll need to get off at the Royal Tomb of King Suro, stop #17. After taking exit #2, you’ll need to walk to get to the bus stop, which is called Gimhae Library. After boarding the bus, you’ll need to take the bus for 6 stops and get off at the Oedong chuk hyeop stop. Walk 10 minutes towards Mt. Gyeongunsan and you’ll find the temple behind Gaya Elementary School. OVERALL RATING: 5.5/10. While rather small in size, Gyeongunsa Temple packs a punch. This punch comes in the form of two amazing shaman murals and a highly decorative and detailed main hall. Enjoy the Yongwang mural at this temple, because you’ll probably never see anything like it at any other temple in Korea. Also, the amazing latticework is nearly unrivalled. This shaman packed Buddhist temple is a must for any Korean shaman aficionado. The long flight of stairs that await you at the entrance of the temple. The view from the pond towards the main hall. Some of the latticework adorning the front of the main hall. This, in particular, is Gwanseeum-bosal. The wooden monkey that takes up residence up in the eaves of the main hall. The main altar inside the main hall at Gyeongunsa Temple. The path that leads up to the Yongwang-dang. With the highly original Sanshin mural inside. The view from behind the Dabo-tap pagoda replica. The Samseong-gak Hall to the left of the main hall. The rather rudimentary, and somewhat cross-eyed, mural of Dokseong. The view from the Samseong-gak towards the main hall. Alongside Bulguksa Temple, Seokguram Hermitage first began construction in 742 A.D. by then Prime Minister, Kim Daeseong. The hermitage was completed in 774 A.D. not long after Kim Daeseong’s death. Originally, the temple was called Seokbulsa Temple, which means “Stone Buddha Temple,” in English. The reason that the hermitage was first constructed, at least according to legend, was to pacify Kim’s parents in his previous life. The grotto at Seokguram Hermitage houses the most beautiful Buddhist sculpture in all of Korea. Underneath the nearly seven metre tall man-made dome, and measuring nearly 3.5 metres in height, is the serenely smiling Buddha, Seokgamoni-bul. Seokgamoni-bul looks out towards the East Sea and he is surrounded on all sides by equally beautiful sculptures of the Four Heavenly Kings, the Nahan, and Gwanseeum-bosal (The Bodhisattva of Compassion). Throughout its history, the hermitage largely remained untouched for the first one thousand years of its design. It wasn’t until the 18th century that this changed under Confucian religious rule in 1703 and 1758. It was left seriously damaged before colonial Japan’s occupation of the Korean peninsula from 1910 to 1945. The hermitage was first discovered by a visiting Japanese postman. From its discovery, Seokguram Hermitage underwent three rounds of full-scale restoration. The first of these restorations started in 1913 and lasted until 1915. Under the efforts of leading Japanese architect and scholar, Tei Sekino, Seokguram Hermitage was completely disassembled and reassembled. It was at this time that a one metre thick outer concrete dome was formed around the artificial grotto. With the addition of 200 stones, the original grotto was irrevocably damaged. Compounding these mistakes was the renovation that took place in 1917. Because of the moisture forming in the grotto from the concrete shell formerly installed by the Japanese, moss was collecting inside the grotto. So to alleviate this problem, the Japanese installed a drainage pipe. Additionally, the concrete was covered in lime mortar and clay. And finally, from 1920 to 1923, a third round of renovations was conducted. This time, once more, the renovations were conducted to lessen the mistakes from the first time around. This time, waterproof asphalt was added on top of the formerly applied concrete. However, this still didn’t help the moisture problem inside the grotto. Through their efforts, and after being liberated from the Japanese, Korean engineers attempted to fix the moisture problem inside the grotto. It wasn’t until 1966, with the installation of an air handling unit, that the problem was finally fixed. And in 1971, the glass partition was installed to protect the sculptures and statues from any damage that visitors might do to the historical grounds, as well as control the moisture level inside the grotto. Seokguram Hermitage is registered as National Treasure #24; and with Bulguksa Temple, it’s a UNESCO World Heritage Site. The path that formerly led up to the grotto in 1912. A look at the grotto before Japanese repairs. A better look at the extensive damage and neglect. The dismantling of the grotto. The landscaping at Seokguram Hermitage after Japanese restoration efforts. Some Japanese posing in front of the grotto during its occupation of Korea. How the grotto looks today. A look inside the grotto at the amazing statue of the Buddha in 2014. The view from behind the main hall at Wonhyoam Hermitage in Gyeongsan, Gyeongsangbuk-do. Located on the far eastern slopes of Mt. Palgongsan, tucked away in a valley fold, lies Wonhyoam Hermitage (which should not be confused with the more famous Wonhyoam Hermitages in Busan or Yangsan). Up a zig-zagging road, you’ll finally come to a ledge that acts as the hermitage’s parking lot. It’s just past a sandy cliff that you’ll arrive at Wonhyoam Hermitage. When you first approach the diminutive hermitage, you’ll notice the amazing views from the valley below. When you get your fill of the views, you’ll first encounter an old storage shed that must be several hundred years old and is still used to the present day. After circumnavigating this natural wood building, you’ll find yourself face-to-face with the beautiful new main hall. The exterior walls to this hall are decorated with some of the more beautiful Shimu-do murals in all of Korea. As for the interior, and housed upon the main altar, sits a solitary statue of Amita-bul (The Buddha of the Western Paradise). To the right and left of the main altar are two red murals. One of these murals is the guardian mural, while the other is dedicated to Jijang-bosal (The Bodhisattva of the Afterlife). Just past the hermitage’s kitchen and dorms, and slightly up an embankment, sits the temple’s Sanshin/Dokseong-gak. This shaman shrine hall houses a very impressive Sanshin mural. The elderly looking Sanshin (The Mountain Spirit) is standing on a ledge with a staff firmly in hand. He is joined by a dongja (assistant) and arguably either Sanshin’s wife, a female Sanshin, or simply another dongja. This painting is joined to the right by an older style Dokseong mural. The entire hermitage, especially in the fall, is beautifully framed by colourful autumnal hues. HOW TO GET THERE: From the Gyeongsan Intercity Bus Terminal, you can catch Bus #803. After 64 stops, you can get off at the Solmaegi stop. You’ll need to walk an additional 15 minutes to get to the hermitage. OVERALL RATING: 4/10. Wonhyoam Hermitage, like the other Wonhyoam Hermitages in Korea, is beautifully, but remotely, located. Because of its remoteness, it is serenely located. In addition to its beautiful location and views, Wonhyoam Hermitage has one of the most masterfully executed murals dedicated to Sanshin in Korea. So if you have the time, and you’re up for the hike along Mt. Palgongsan, you should make Wonhyoam Hermitage a stop along your way. The view from the hermitage parking lot. The amazing view as you first approach Wonhyoam Hermitage. The old storage building at the hermitage. The main hall at Wonhyoam Hermitage. A beautiful Shimu-do mural that decorates the main hall. A look inside the main hall at Amita-bul on the main altar. The guardian mural also housed inside the main hall. The intricately painted main hall. The view from the shaman shrine hall. A look around the main hall at some of the fall colours.